Mmmmm. Ron. I love his little smirk. And, oddly enough, his eyebrows. Great job! And you've got that goofy grin down really well. Lovely work. OMG! I worship your talent. . .It's beautiful. . . I swear, I need an icon made out of that. . . I just love it! :O OMG. How talented are you? Followed Miss RedBlaze's link... wow. Am much in love with the Ron! This is brilliant. I love how you draw him smiling with his eyes too. Quidditch! *dies* Sooooooo beautiful. Perfect Ron. That could be the most beautiful thing I have ever seen - can Ilick his neck? I adore this picture. You've managed to capture so much about my favorite character! It's just perfect. The twikle in the eyes, the symbol of a night, the friend who will sacrifice himself for you, the smirk that he'll give you a hard but fun time in the mean time. Just wondderful. Thanks! :~D Ron is my favourite too. Oh, that's beautiful. Did you do the art in your Harry icon as well? Yes, Harry is mine too. :~D He was done for the Wizard Cards over at mugglenet. AWWWWWWW He is such the sweetie!!! Oh god that neck muscle there.... I just want to reach out and touch it. I just adore his smile, and I love the way his hair is flopping over his forehead. Oh god that neck muscle there.... I just want to reach out and touch it. I decided to stop by your LJ when I saw your name on vanilla_charm, and I'm so glad I did! A truly good fan artist is a rare treasure indeed. 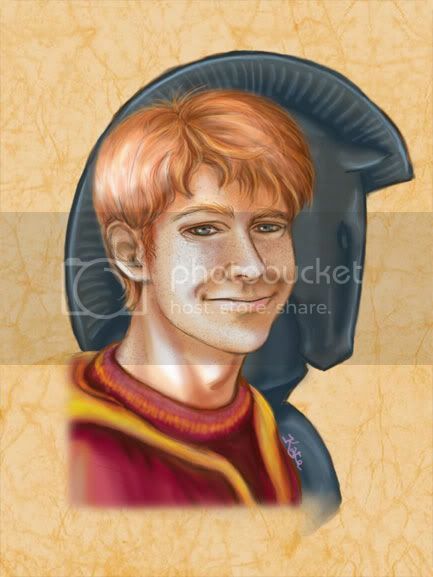 This rendition of Ron is just perfect. May I make an Icon out of this design? Will credit. Let me know, thanks! You don't know me. I found you via hp fanart search. I like your work ALOT!!!!! Very nice! I'm ok with you making an icon of it (in fact, if you scroll up a bit, you'll see I made one :~) ), but it might be worth checking with lj user merrycontrary. She's in charge of the cards.